The “Show List” will be posted on www.iowastatefair.org. View Contest Rules by clicking here. To Enter-Complete the entry form and return to contact person. 1. All entrants must have completed kindergarten through the 3rd grade for the 2018/2019 year. 2. 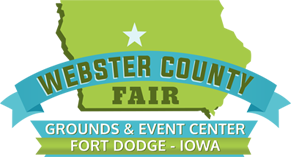 All entrants must be available for judging on July 7th, 2017 at 6:00 p.m. at the Webster County Extension Office (217 S . 25th Street, Suite C-12, Fort Dodge). 3. Judging consists of an interview with the committee. Judging will be on appearance, poise, personality and interview. The judges will be looking for a neat, natural little girl, not miniature adults. 4. All entrants must be able to attend the fair on Wednesday, July 10, at 6:45 p.m. for the crowning of the Little Miss during King/Queen Contest. The little miss contestants will be called up on stage after the clothing event and prior to the King/Queen Contest.